We have a full line up for you this winter. There is something for everyone no matter your skill level. Want to try curves but not sure you want to make a full bed sized quilt? This quick and easy modern quilted wall hanging uses the Mini Quick Curve Ruler. 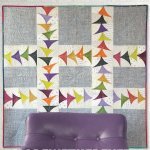 Create a modern star quilt using Sharon?s method of foundation paper piecing. Create a modern star quilt using Sharon's method of foundation paper piecing. This course is perfect for anyone who would like to learn to quilt. This is a great project that is designed to spark your creativity! Want to learn how to make a variety of easy, fun pouches? Join Laura each month and create a new project from the Hoopsisters Sisterhood 2019 Series. This pattern comes from a Fons and Porter magazine. Interested in a once a month club where you can meet some new quilting buddies and build yourself a beautiful Log Cabin Quilt? Learn the precision technique for migrating geese and make a fun quilt. These quilts are addictive! Every hexagon you make is different ? and has three options! If you have enjoyed the Breakfast Club, Stash Pot Pie, or have a stash to bust, you will love this club. Want to reduce your scrap pile? Join Chris once a month and work at your leisure to shrink that stash! In this class we will be making mini quilts. Great little pieces to hang, put on your table or a gift for someone special. Tucker U is a fantastic program that offers classes using the tools by Studio 180 Design.? Would you like time set aside for you to sew? Can't get away to a sewing retreat? Join Freda and finish projects or get new ideas to create great projects with your scraps. Join Elaine as she guides you through making this elegant bag that will carry and organize all your sewing, quilting or other craft supplies.